I couldn’t let it rest. After Zaigham Zulquernain (@zaigham_inc on Twitter) invited me out to Proof Vodka Bar at the Intercontinental Hotel on Bloor Street to celebrate his birthday, it occurred to me that the Madtini Lab Intoxicologists had not created a special drink for him. Zaigham has been a longtime supporter of Madtini and we’ve schemed a few ideas over the past year. I partially blame the oversight on the fact that our crew was catching up on Season 2 of True Blood before the new season started (dang you Sookie Stackhouse!!). The night at Proof was all about the Mojito. Now ask anyone around the labs and they’ll tell you no one loves a delicious Mojito more than I do. I searched around for something just a bit out of the ordinary and found it on the Bacardi web site – behold the Pineapple Pepper Mojito. We stuck to the recipe on the site, but of course we like our martini glasses – so of course we served it up Madtini-style. The drink turned out to be a delicious combination of mint, pineapple and lime. The best thing about it is… I made enough for two. Rub the mint around the rim of the cocktail glass. Add the leaves to the glass. Squeeze the juice from half a lime and add that to the glass. Add 8 peppercorns and 2 teaspoons of sugar. Muddle lightly to mix the flavours. Add a handful of crushed ice. 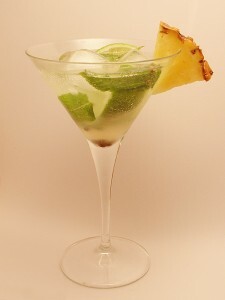 Pour the rum over the ice and add the pineapple juice and club soda. Garnish with a chunk of fresh pineapple. I literally don’t know what to do with myself. I have never had someone name a drink after me…especially such a cool one. Were dying to see (and try) the House of Bamboo cocktail soon. CHeers!